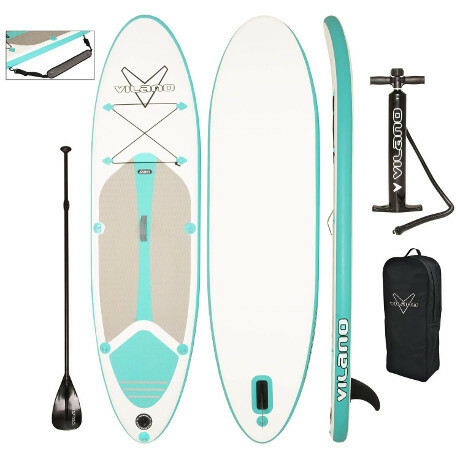 Vilano is actually one of the latest bloomers in the industry of inflatable paddle boards but also one of the most invested names. Indeed, Vilano has revolutionized the branding of iSUPs since it springs from one of the most diverse backgrounds in the domain. Vilano is a leading manufacturer in the sports section but only recently have they celebrated their introduction to the inflatable paddle board universe. Nevertheless, the brand has already established a firm foundation by creating some of the most premium iSUPs on the market today. Hence, will Vilano manage to build up a reputation that can compete with the OG manufacturers and will its experience in other domains be of any good in the aquatic spectrum? There is only one way to find out. 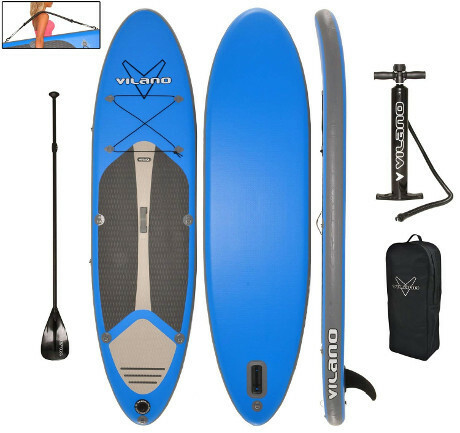 Let us take a look at the 3 best-selling inflatable paddle boards made by Vilano! The Vilano Journey is one of the brand’s highest achievements as it has managed to lure in a diverse audience due to its general appeal. Indeed, this is the brand’s leading board because it managed to combine design, quality and price in an unprecedented manner. One of the biggest selling points for the Journey has got to be its size. In fact, the board at hand is so versatile because it measures 9 feet 9 inches in length which fits young adult and adult paddlers like a glove. Also, the board is designed specifically at 30 inches in width in order to achieve the most balanced width to length ration, granting the paddler an exemplary stability. Finally, at 5 inches in thickness, Vilano sealed the deal on the Journey as one of the most robust Vilano boards out there and one which can handle up to 240 pounds as maximum load. Performance is definitely important which is why the Vilano Journey stands out as one of the most reliable recreational boards on the market. In various reviews, the Journey manages to stand out because of its ability to handle diverse environments substantially well because of its solid posture, its lifting nose and smooth edges. The board is thus capable of facing anything from steady lake cruises to raging white wash slides. Besides being significantly responsive due to its single fin design, the board at hand is also very much complete. We can’t really seal the deal on an inflatable paddle board without the proper package and Vilano is fully aware of that. 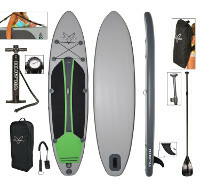 Hence, the board at hand comes with a simple yet fulfilling package that includes all you’ll need to enjoy your SUP”ing experience. 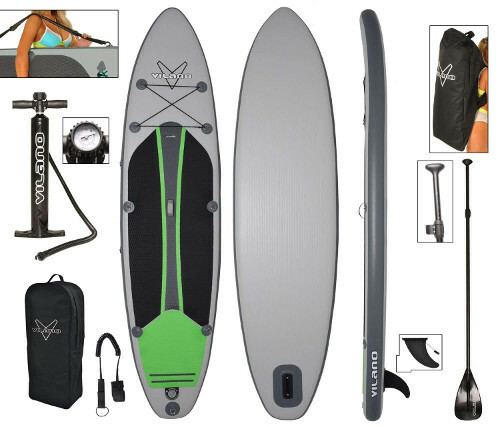 The Vilano Navigator is perhaps the most familiar Vilano board on the market. Actually, this board has been sold enough to land the brand a spot amongst the biggest brands in the field. However, what is it that makes the Navigator so appealing to beginning paddlers? And why should you consider it? First things first, the elements which determines the sell-ability of any inflatable paddle board is its ability to adapt to the paddler’s needs and requirements. Accordingly, the Navigator does just that by sticking to the universal 10 feet in length, which couples compatibility with performance. Indeed, the board is great for young and adult paddlers but more importantly, it is 31 inches wide, which makes it stable enough for beginners and intermediate paddlers. Lastly, unlike the Journey, the Vilano Navigator actually comes at an astounding 6 inches in thickness that places this board amongst the toughest on the market. Needless to say, the Vilano Navigator is a beast but how does that impact its performance? Well, from its build, you can already guess the intention of such a well founded board. However, it isn’t until you study the upgraded design that you begin to learn why this board is the best Vilano on the market. Indeed, the Navigator’s wide hull, smooth edges and responsive single fin navigation system ranks it as one of the best recreational paddle boards on the market. 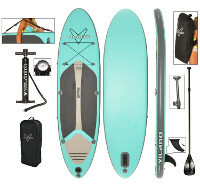 For this board to be capable of handling up to 250 pounds it must be made of military grade PVC but that wouldn’t stand out if not for the solid package it comes with. Truly, the Vilano Navigator benefits from a holistic packaging experience which includes all the tools you’ll need to transport, secure and ride the board comfortably. Unlike the previous two, the Vilano Voyager is actually a special edition since it is dedicated to a more specific type of paddlers. 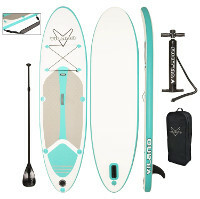 Indeed, the Vilano Voyager is capable of doing anything a recreational paddle board can do but it is developed more towards the touring community. Indeed, the Voyager is definitely large but for a very good reason. At 11 feet in length, the board is made to cater for adult paddlers exclusively but most importantly, it is also developed to pull you closer towards the touring realm. For longer journeys and experiences on water, the Voyager manages to grant you ample space to get yourself comfortable as you paddle on longer tracks but the extra stability isn’t a coincidence. In fact, the board at hand measures 32 inches in width which is a record for Vilano but also necessary to grant the paddler enough stability to forget that they’re on water. Eventually, to wrap it up and highlight quality, the board at hand comes at 6 inches in thickness which will prevent the board from sinking under a max weight capacity of approximately 300 pounds. Since it’s a touring board, the Vilano Voyager needed to check a list of boxes that confirm just how reliable can a recreational board be in this field. Hence, the Voyager is primarily one of the widest board which is equivocal to stability but most importantly, the board at hand features a sharp nose. In that respect, the Voyager isn’t only made to resemble a block of wood but it’s actually given the characteristics of a racing board that will managed to cut through water much fast and response vividly thanks to its single fin navigation. In conclusion, the Vilano Voyager is a representative of the brand and no representative is complete without proper packaging. Accordingly, Vilano hooks this board up with a full package that doesn’t leave any of the essential tools behind but only brings you the most significant of which. Hey There, my name is Alex Smith, I'm a big fan of getting out in the water and enjoying the outdoors. I've been sup'ing for years now and I'm enjoying it everyday. For me paddle boarding was just an idea before it transformed into a passion and through that process I have learnt so much about this amazing sport. PaddleLove.com is a participant in the Amazon Services LLC Associates Program, an affiliate advertising program designed to provide a means for sites to earn advertising fees by advertising and linking PaddleLove.com to Amazon properties including, but not limited to, amazon.com, endless.com, myhabit.com, smallparts.com, or amazonwireless.com. Additionally, PaddleLove.com participates in various other affiliate programs, and we sometimes get a commission through purchases made through our links.